Ankle exercises are important for the strength and flexibility of our feet and lower legs. They not only keep us upright and balanced, but also can improve the overall health of our whole body! When you consider there are over 126 muscles in the feet or 1/4 of the muscles in our whole body are in the feet, it would be silly to neglect foot and ankle exercises all together. I love working out and stretching my feet and ankles; it invigorates my whole body, improves how I stand... my posture and body awareness are also better. No wonder the feet are the foundation of our bodies, if they are happy and well taken care of it radiates up the body! To keep your ankles and feet strong and flexible try out some of my favorite ankle exercises and do them 4-5 times each week. The Toe Lift foot exercise shown here to the left is one way to strengthen the ankles and the top of the foot. This exercise works the important dorsiflexor muscle on the top of the foot that is important for balance. when this muscle is weak we start shuffling our feet and wonder why we trip on rugs and cracks in the sidewalk. The Heel Lift or calf raise shown to the right is another way to strengthen the ankles and aid with your flexibility and balance. When you rise up on your toes try to center the weight over your first and second toe joints to stay balanced. The One Leg Stand as shown here to the left is a balance exercise you will find on any balance test. In this position you cannot help but to sense the work in the feet and ankles as they are struggling to keep you upright. Over my years of teaching balance and posture classes I have found a couple of good ways to practice the one leg stand for better ankle strength and flexibility. First, just transfer 80% of your standing weight into one leg, and only if you are stable then raise the other leg as shown. Second, focus on your navel! Draw your belly button in to your spine. This is your center of balance. Third, try standing in a corner and shifting your weight, you can gently scrape the walls to stay upright safely. Another way to improve your ankle strength and work the muscles in the foot is to stand or walk in tandem. One foot directly in front of the other. Walk a straight line. The Foot Corrector exercise machine is a wonderful way to build the arches of the feet and develop flexibility and strength of the ankles and toes. I can't tell you how much my feet love this machine at the end of a long day standing on a hard surface! Those long skinny peds are pretty flat to begin with, so using this machine to arc them up makes them want to sing. A good way to imitate this machine is get a tennis or slightly larger size ball that has some give and position your foot as shown. Then press down with the ball of your foot wrapping your toes and feeling the bottom of the foot arc up. 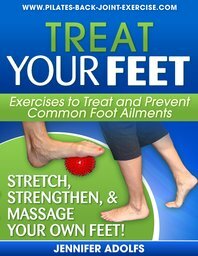 Find these and more of my favorite ankle exercises for strength and flexibility in new Foot Ebook here today!